More than six hours after a signalling fault on the train network sent Hong Kong into commuter chaos, the city’s rail operator announced that a temporary fix was in place and its four affected lines had resumed normal service. At 11.45am on Tuesday, the MTR said trains were now running every four minutes. 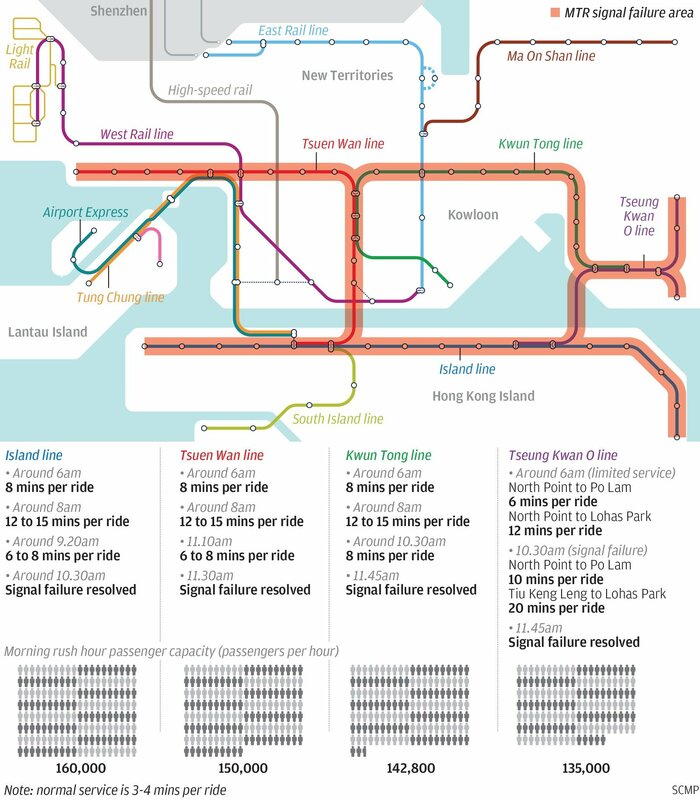 An unprecedented four lines – the Island line, Tsuen Wan line, Kwun Tong line and Tseung Kwan O line – were hit by severe delays. The MTR called on commuters to use other forms of public transport after journey times were extended by 40 minutes on some of the routes. The transport operator first noticed the signalling failure at about 5.30am, affecting the Island, Tsuen Wan and Kwun Tong lines. Train frequency was reduced, and travel times were increased, leading to large crowds of waiting commuters at stations across the city. At 9.25am, the MTR announced that normal train service was gradually resuming on the Island line as the issue there had been resolved. But at 10.18am, it said the Tseung Kwan O line had also broken down. Crowd control measures had to be put in place at various stations, including Kowloon Tong – the interchange station for the East Rail and Kwun Tong lines. At about 10am, dozens of passengers were told to wait at the station lobby, with some being moved to the platform every 10 minutes or so. Some commuters chose not to wait and tried to jump over the railing, while others switched to another mode of transport. Student Ma Hei-ming, 18, decided to catch a bus or taxi. “I have waited for more than an hour … I couldn’t stand it,” he said. Was power supply issue to blame for six-hour MTR delay? Billy Lam, 54, decided to try and take a bus to Kowloon Bay after waiting for an hour. “I only saw one train during my wait,” he said, referring to Tiu Keng Leng-bound services. At Yau Tong, trains were departing for North Point every 10 to 15 minutes. Commuters sat on staircases and floors as they waited. Police officers were on standby. “I got down [to the platform] an hour ago, saw what a chaotic situation it was, and went back up to search for other transport, but there was no bus, no minibus, no taxi available, so here I am,” commuter Andrew Yeung Kam-lam said. A woman surnamed Leung said it took her “almost an hour” to get from Tseung Kwan O to Yau Tong. More than 100 passengers were stuck on the platform at Choi Hung. Although the MTR had earlier said Kwun Tong line services would run every 12 to 15 minutes, no train was in sight for about half an hour. When one finally arrived, passengers attempted to squeeze into already full carriages. Opinion: As MTR project resumes, are safety standards sinking in Hong Kong? Fung Yee-ling, a clerk, said she worried that her boss might blame her for being late for work. “If the next train comes and I still fail to get on it, I will go to take other modes of transport. But I’ve heard people who are taking buses are also stuck in traffic jams,” she said. The train disruptions had a knock-on effect on road traffic, with the drive from Argyle Street in Mong Kok to the Eastern Harbour Tunnel taking 83 minutes instead of the usual 25 minutes at about 11am. Other areas, such as Ho Man Tin, also faced peak hour congestion. Ride-hailing service Uber saw heavy demand, with a trip to Causeway Bay from Ho Man Tin costing HK$220 (US$28), double the normal charge. Tram services were also affected, with hundreds of people queuing up at a station in North Point. The queue was so long that it reached the next stop. Li Wai-yu, a 45-year-old marketer on her way to Kwun Tong from Choi Hung, said she believed taking the MTR would still be faster despite the delays. “The MTR problems caused serious traffic jams on the road. I have no choice,” she said. Hyman Wong Hoi-ming, who passed by North Point on his way to Wan Chai at 8.30am, waited for five minibuses until managing to get on one. The civil servant, who was an hour late for work, said he had seen a woman hitchhiking at Fortress Hill. “She stuck out her thumb trying to catch a taxi or a private car. But no one answered her request,” he said. Speaking to the press on Tuesday morning after the initial announcement of the delays, MTR Corp operations director Adi Lau Tin-shing said the team had noticed the signalling failure at about 5.30am on Tuesday as it started to prepare services for the three lines. Lau said the company could provide only 20 to 30 per cent of the services normally offered during peak hour, and called on other public transport operators to provide extra services. He said this was the first time in his recollection that three MTR lines had been affected by such delays at the same time, adding that the operator would conduct a review of the incident. Lau said the MTR Corp issued a red alert at 6.20am to inform relevant departments and other public transport providers about the situation. Speaking separately after a radio show, Secretary for Transport and Housing Frank Chan Fan said officials had already called on other public transport providers to beef up their services while the fault was being repaired. Asked if the MTR would face tougher penalties for the service delay because three of its lines broke down concurrently, Chan said the government would follow up on the “special” situation with the railway operator and make a decision subsequently. Speaking before her Executive Council meeting on Tuesday, Hong Kong Chief Executive Carrie Lam Cheng Yuet-ngor called on employers not to penalise late staff, noting that the MTR delays were not something workers had control over. “If the railway malfunction has made workers late for work … I call for employers to be considerate,” she said. Lam said she would urge the MTR Corp to improve preventive measures against breakdowns but conceded she did not know what had caused the fault. “I don’t know what today’s issue is – is it mechanical? Or manpower?” she asked. Secretary for Education Kevin Yeung Yun-hung wrote a post on his Facebook page citing Education Bureau guidelines that suggested schools should not penalise pupils who were late because of traffic issues. He said he had contacted several principals on Tuesday morning and was thankful to learn they were handling latecomers – both teachers and students – with discretion. Several district councillors and community officers from the pro-democracy camp have planned a protest at the railway operator’s headquarters in Kowloon Bay for 3.30pm on Tuesday. They slammed the MTR for frequent service delays and poor performance in crisis management, citing its failure to provide shuttle buses in the wake of the service breakdown. Civic Party lawmaker Tanya Chan, of the Legislative Council’s subcommittee on matters relating to railways, said it was unacceptable for the MTR to have four lines break down in one morning. MTR service breakdowns had become very frequent over the past year, she said, as she called on the government to follow up on the incident.